At the request of NPD International, this IPP designed and manufactured 9.6Ghz Metatron 4025 msystem was especially made for our North American customers. A comprehensive integrative medicine system, “Blue Opal” combines Western, Traditional Chinese and Ayurvedic medicine methodologies. NEW features include a 9.6Ghz frequency generator, 13-point Fleindler evaluation scale and the incorporation of SONY Virtual Reality technology. Venitian Hotel in Las Vegas. Psychophysics & the Chronic Disease Research Foundation. BioPhysics, the next phase in the evolution of medicine is here. NPD International is the #1 distributor of Metatron systems to English Speaking Users. Providing comprehensive English training and proprietary NLS Diagnostic research to a Global audience. Metatron is officially referred to as a ”Hardware-Software Bio-Resonance (NLS) Diagnostics System” by the Russian Federation. NLS Diagnostics is the reading, processing and analyzing of information discerned from the output of electromagnetic waves issued by the human body, even DNA and chromosomes. This technology is used to provide a safe, fast and informative health assessment to aid physicians in determining an individual’s diagnostic requirements to clarify and verify the provisional diagnosis made, and also to evaluate the dynamics of dysfunctional changes in a human body. 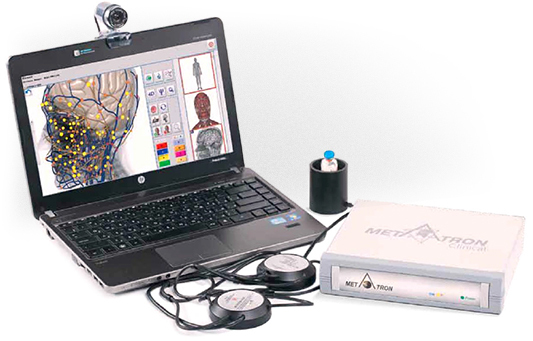 Metatron is truly a unique medical tool, and in fact, is the only patented and ISO certified torsion-biofeedback assessment and therapy system. More thorough health information is obtained in a shorter period of time Impartial. Scan assessment validates the patient experience with consistency Knowledge. Share and compare assessment results with fellow practitioners Therapy. 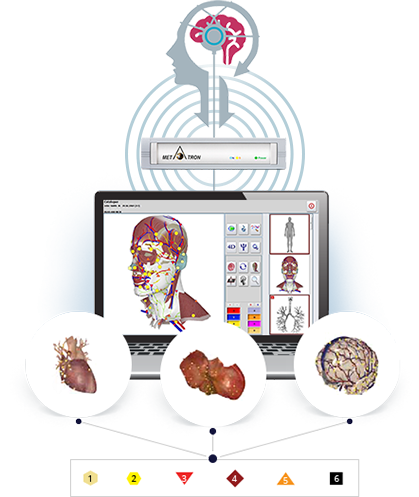 Health assessment is accomplished by means of sensors placed on the head, which are capable of interfacing, via electromagnetic waves, with the subcortical brain, the largest repository of information about the ongoing processes within an organism. The information obtained is reformed into a digital signal, which is subsequently decoded by Metatron’s advanced software. This information is displayed on the computer screen over a virtual model of the organ, tissue or cell being evaluated. The display presents the organ’s health in a color-coded format, varying from light yellow (healthier) to orange, red, purple and black, where organ stress is maximal and the health of the organ is highly suspect. Recommendations regarding possible pathologies and avenues of potential treatments are given to the physician to explore with traditional medical diagnostic methods.